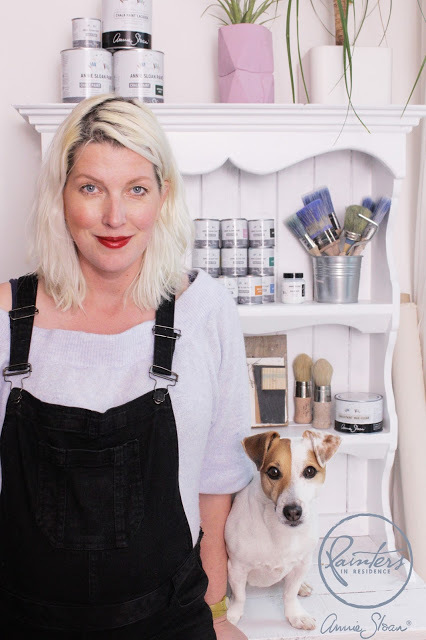 You might have seen on my social media that I am Annie Sloan's latest painter in residence. All very exciting!! Over the next couple of months you will see a whole lot of new projects from me using the brilliant Chalk Paint®, waxes and fabrics of Annie Sloan. According to Annie's website "The painter in Residence concept is very loosely based on the way an art gallery or museum will, from time to time, have an ‘artist in residence’ to inhabit those places as a way to get inspired to create their own works inside or outside the venue. Each Painter in Residence is carefully selected by Annie based on their style and the interesting work they create. They won’t be taking up residence at Annie Sloan HQ, but they will be exploring the boundaries of decorative furniture painting. They are all different in approach, colour, tone and textures and their styles range from French elegance to funky Bohemian to quirky rustic country fused with loud fabrics." In my case expect up-cycling and reuse projects in my toned down Scandinavian style. First up it is concrete! You guys probably know I like working with concrete, I wrote a whole book about it! :) These succulent planters are one of my favourite things to cast. I've made them before were I first cast the concrete and then paint them but I was wondering if there is a way I can incorperate the paint colours with the casting process and end up with a more organic looking paint splatter effect. I love the random paint splatter look! These planters would make such lovely handmade gift, and a very budget gift that is too as you can pick up a succulent or cactus for under £5. I make these planters in big batches so I always have a few pots ready to give away. What colour combination do you like best? I think the black pot might be my favourite. I used Chalk paint lacquer inside the pots. As these planters don't have drainage holes they are best for plants that don't require a lot of watering like succulents and cacti. I just spritz them with some water once a week to keep the plants happy. I hope you liked my first Painter in residence project! Another one will follow soon and it involves a bit of upcyling! To see more of the planters and to see all the paint colours hop over to the Annie Sloan website. I'm still on my maternity leave so new video's and makes will appear a bit random, not the once a week like previously. The make sure you don't miss out on any new uploads sign up for my newsletter and follow me on Instagram.